Clicking on the small pic below will open a new page, with a larger image and details of price, condition etc. Here you'll find programmes and other memorabilia currently for sale.The most recent additions to the list are found at the top of the page. This page only includes items which are currently FOR SALE. 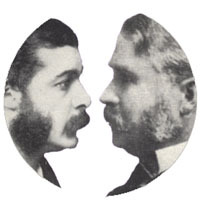 However, as the items which have already been sold form an interesting record of Gilbert, Sullivan and D' Oyly Carte performers in the nineteenth century, I have created an extensive archive, for researchers and collectors, with the material presented in date order, for ease of reference, including, where possible, opening night dates, run lengths and cast changes. 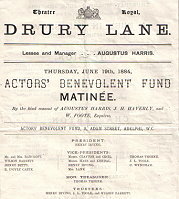 Selected as the finale of the annual Actors Benevolent Fund Matinee, at Drury Lane on June 19th 1884, was a selection from Princess Ida, featuring Durward Lely, Charles Ryley and Henry Bracy. Also on the bill that afternoon were, among many others, Henry Irving, Ellen Terry, and Kate Vaughan. Madame Patey and Mr Santley also sang, and it is maybe not entirely coincidental that Richard D'Oyly Carte is named on the cover as Vice-President of the charity ! Price reduced - now £40. On Tues December 11th 1900 the Garrick Theatre hosted a benefit matinee in aid of the Sailor's Home in Chatham, Kent. The usual mix of playlets and variety entertainment, George Grossmith performed some humorous songs and selections, and his brother Weedon appeared in his own comedy, A Commission. Dan Leno joined other great names of the day, including H.B. 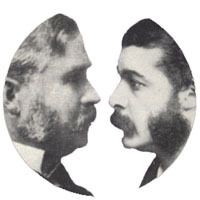 Irving, Martin Harvey and Hayden Coffin. Price reduced - now £30. On Wednesday afternoon, July 16th 1890, at St James's Hall, Henry Irving and Ellen Terry gave a recital of scenes from their production of Macbeth, first seen at the Lyceum in 1888. Sullivan had composed music specifically for this production, and at the 1890 recital a full orchestra played the pieces. This flyer for the event is printed on hand made paper. Price reduced - now £10. 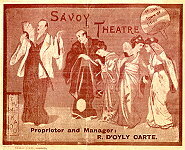 The second revival of The Mikado, which opened at the Savoy on 6th Nov 1895. The production featured Rutland Barrington, Jessie Bond and Rosina Brandram in their original characters, and closed after 127 performances, on March 4th 1896. This programme is dated for 6th December. Price reduced - now £60. A fundraising event in Watford in 1919, to raise funds for a local hospital, locals presented seven of the operas in pageant form, directed by W. Simms-Bull, former Stage Manager at the Savoy and on some of the D'Oyly Carte tours. The 36 page handbook includes his photograph, as well as casts and plots of the operas presented. Price reduced - now £8. 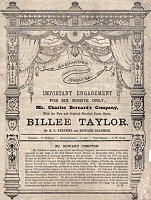 Steven's and Solomon's comic opera "Billee Taylor" was later toured by D'Oyly Carte, but in April 1881, when it appeared at the Alexandra Theatre in Liverpool, it was under the management of Charles Bernard. Price reduced - now £8.